Well, here we are at the Teton Village staying in a ski-lodge which I have to say is wonderful. We once again have all the comforts of home. 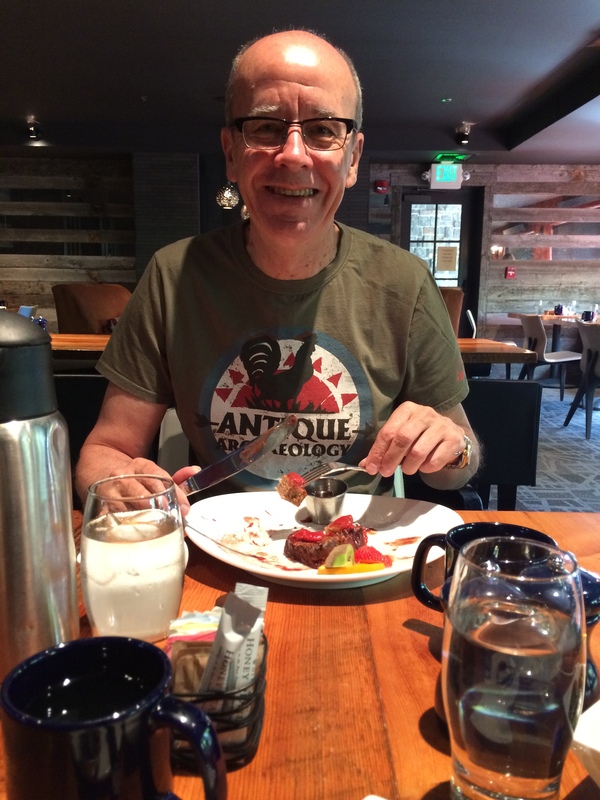 Our day started with a lovely breakfast and for the benefit of and as requested Steve, here’s a photo of Simon eating his banana bread french toast with strawberries and another one of him at dinner tonight with his short rib. 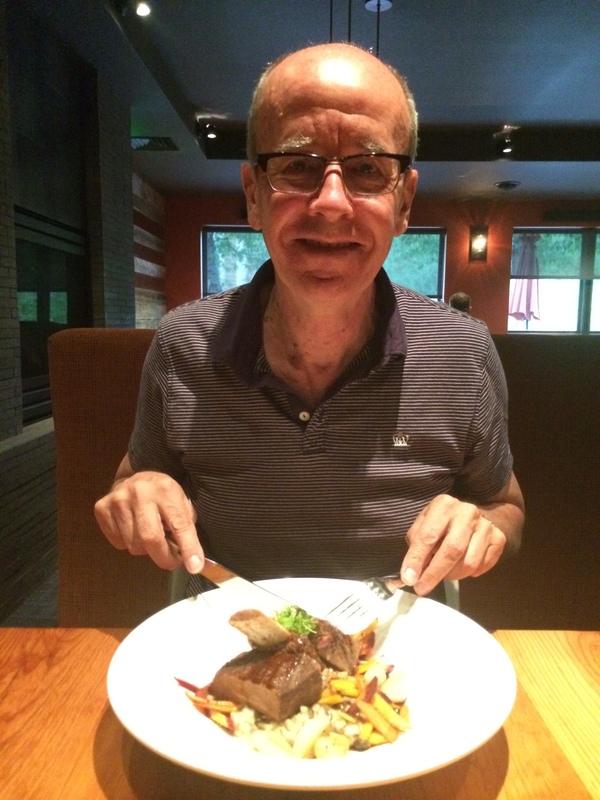 He said both meals were delicious! 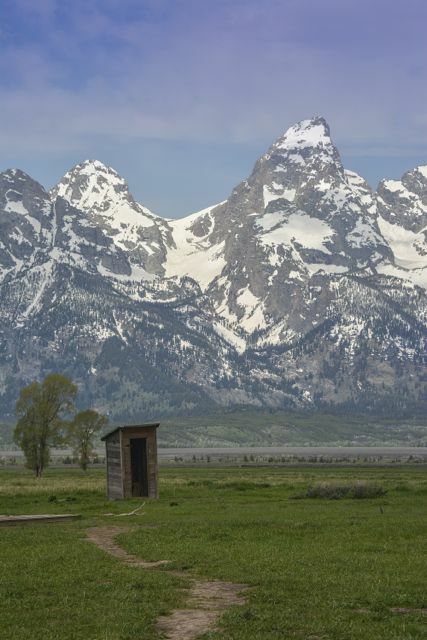 Our first full day here has confirmed what we already knew, the Tetons are magnificent. No matter where you are you can see the mountains. 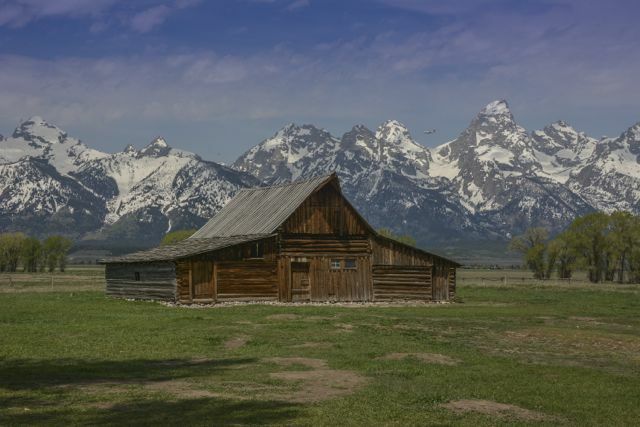 Grand Teton, at 13,775 feet (4,199 m), is the highest point of the Teton Range and the send highest peak in the state of Wyoming. 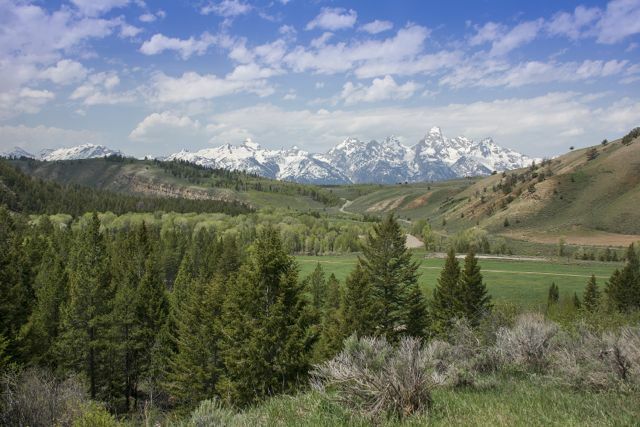 The Teton Range is a sub-range of the Rocky Mountains, which extend from southern Alaska to northern New Mexico. We visited the site of the ‘John Moulton Barn’. 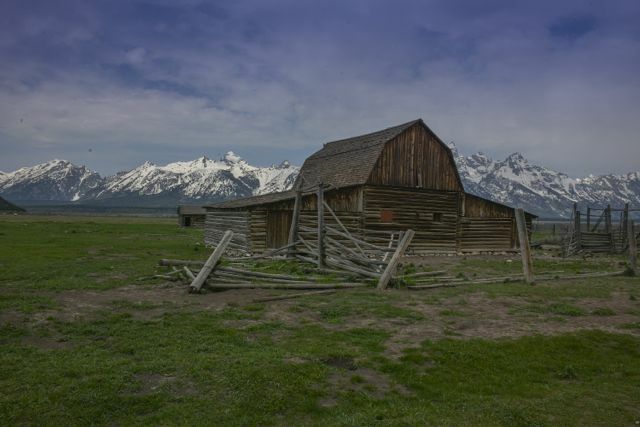 This is very famous and anyone who comes to the Tetons stops to take a photograph hoping to replicate the classic view of the barn. 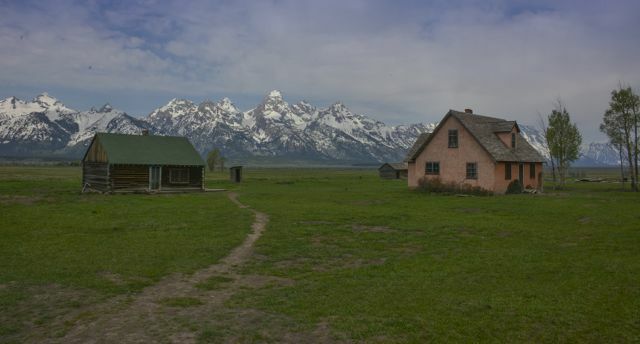 It sits in Mormon Row where 33 homesteaders from Salt Lake City first started a community at the turn of the 19th Century and clustered their farms to share labour and community. Some of the homes and barns still remain today as do some of the ditches they dug by hand to water their crops. One of the original homesteaders was John Moulton and his grandson and family still own the homestead he built and it really is a beautiful place. We were lucky enough to meet Iola Moulton who showed us around and was obviously very proud of how the property has remained in the family all these years. The surrounding area is owned by the National Park Service. 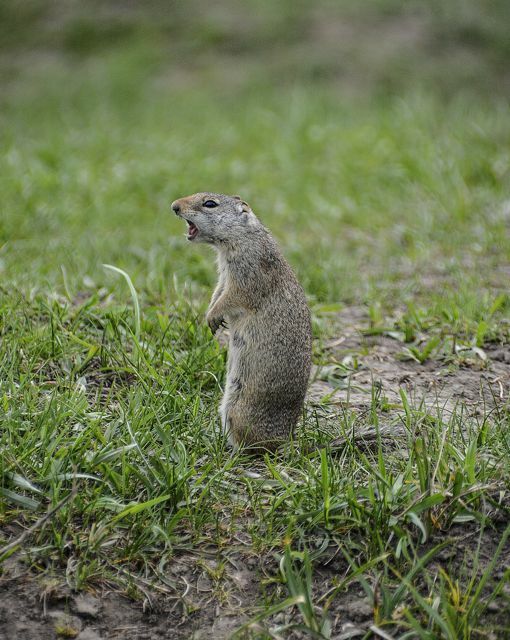 Ground squirrels live underground near the barns and they may be small but the noise they make when warning others of impending danger is amazing. They are like very small meerkats, they even sit bolt upright on top of their burrows to warn others of danger. 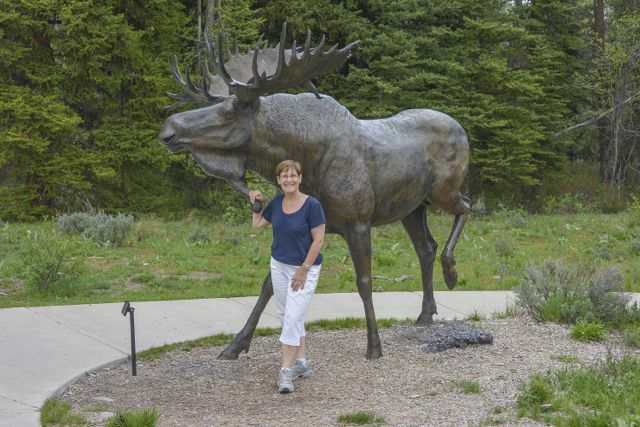 We are hoping to see lots of moose here but just in case we don’t Simon took a picture of me with this one at the Visitors Centre! We then visited Jenny Lake. It was formed approximately 12,000 years ago by glacier activity. 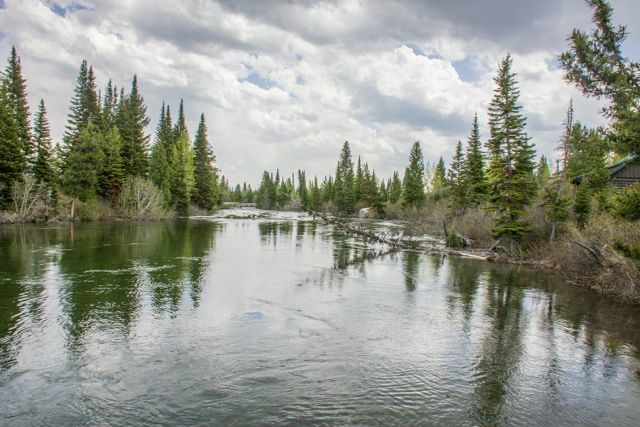 It is estimated to be 423 feet (129 m) deep and encompasses 1,191 acres. 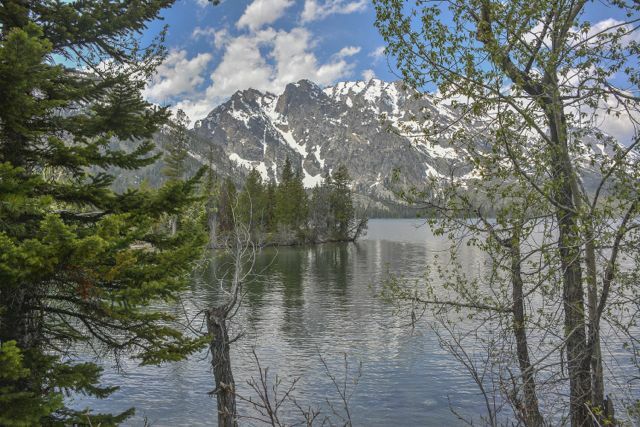 Jenny Lake is considered to be a major focal point in Grand Teton National Park, with many hiking trails, scenic boat rides, and quick access to the major climbing routes onto the tallest peaks of the Teton Range. By the way …………… does anyone now the cost of bear spray? We paid nearly $50 dollars for a can that they say will last for about seven seconds!!!!! Still, one can’t put a price on safety! Let’s just hope we won’t need to use it. I have run out of adjectives and realised how inadequate the English language is. If I can be this gob smacked by the words and pictures, what the hell must it be like to actually to be there? Wonderful I would think. Travel safe and mind those bears in your rear view mirror!! Thanks Malcolm. You must put it on your bucket list. We are more amazed everyday at the beautiful things we see. Again, amazing photos! Do you plan to do a hike up the snow capped Tenton peaks? 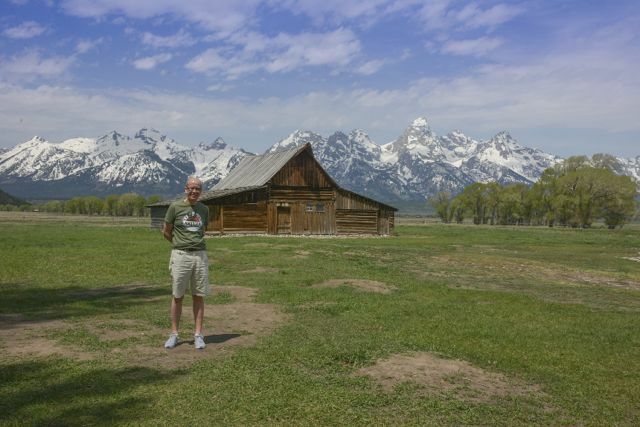 Is that an airplane flying between the mountains behind the first photo of The John Moulton Barn? I believe you are on the average side with what you paid for the bear spray! I was checking it out online and even at Wal-Mart its around $40, so I don’t think you got ripped off! Better to be safe! I was so annoyed Dot that I couldn’t have the French Toast, Si said it was fabulous. The noise the squirrel was making was amazing, it was so loud. Dot, you wait until you see the t-shirt I’ve bought! !